Chamundi Hill is about 13 kms from Mysuru, which is a prominent city in Karnataka State of India. Chamundi Hills is famous not only in India but also abroad. ‘Chamundi’ or ‘Durga’ at atop of the hil, the famous Sri Chamundeswari Temple is the fierce form of ‘Shakti’. She is the slayer of demons, ‘Chanda’ and ‘Munda’ and also ‘Mahishasura’, the buffalow-headed monster. In the later days, the hill came to be known as ‘Chamundi Hills’ in honour of the Goddess Chamundi, the chief subject of the ‘Devi Mahathme’. The Goddess is believed to be an incarnation of Parvati, the consort of Lord Shiva. A large number of devotees from all over the country and also from abroad visit the temple every year. They believe that the Goddess fulfills their desires and aspirations. Chamundi Hills rises to a height of 3,489 feet MSL and is visible from a distance itself while traveling towards Mysuru. There is a good motorable road to the top. Besides from Mysuru side, there is also a motorable road from its rear side, i.e.road goes to Nanjangud. City Bus facilities are available to visit the hills. Karnataka State Road Transport Corporation (KSRTC) operates regular bus services every day for the convenience of pilgrims and others. A temple of great antiquity with over 1,000 years of history, it was a small shrine initially and assuming importance over the centuries it became a big temple as seen today. It is being assumed significance after the Mysuru Maharajas, the Wodeyars, came to power in 1399 A.D., who are great devotees and worshippers of the Devi, Chamundeswari became their home deity and thus assumed religious prominance. The crowning glory of Mysuru, Chamundi Hills is an enchanting place surrounded by natural beauty. In the forest, there are varieties of trees, birds and animals. While going up the hills, a bird’s eye view of Mysore can be seen and several prominent places be spotted. It offers a spectacular scene when the Palace and its surroundings are illuminated during the Dasara and other occasions. Some of the places that can be spotted from the hills are the Palace, Lalitha Mahal Palace, which houses the ITDC hotel, Dasara Exhibition grounds, Race Course, Golf Ground Kukkarahalli Lake, St. Philomena’s Church, and Krishnarajasagar (K.R.S) at a far off distance. Besides the Chamundi and the Mahabaleswara temples, there are a few more temples are at atop the hills. There are also some interesting spots and the monolith statue of ‘Nandi’ is among them. While proceeding towards the Chamundi Temple, the statue of ‘Mahishasura’ attracts the visitors. The ‘Chamundi Village’ is located close to the temple. The Architecture of the Chamundi Temple: The temple is of a quadrangular structure built in Dravidian style, it consists of the Main Doorway, Entrance, Navaranga Hall, Antharala Mantapa, Sanctum Sanctorum, and Prakara. There is a beautiful seven-tier Gopura or pyramidal tower at the entrance and a ‘Vimana’ (small tower) atop the sanctum sanctorum. Atop the ‘Shikara’, the tower at the entrance, are seven golden ‘Kalashasa’. Krishnaraja Wodeyar III repaired the shrine in 1827 A.D and built the present beautiful tower at the entrance (Gopura). Blessed by the Goddess, Krishnaraja Wodeyar, an ardent devotee of the mother Goddess, presented‘ Simha-vahana’ (A lion-shaped vehicle) and other animal cars and jewels of value to the temple a. The cars are used even now for processions on special religious occasions. The tower at the entrance has a small image of Lord Ganesha on the doorway. The doorway is silver-plated and has the images of the Goddess in different forms. On either side of the doorway have images of ‘Dwarapalakas’ or door-keepers. As one enters inside, on the right hand side is a small statue of Lord Ganesha, the remover of all obstacles. After a few steps, there is a flagstaff, the footprints of the Goddess and a small statue of Nandi, facing the sanctum sanctorum. On the right side, before approaching the flag staff, there is an image of ‘Anjaneya’ attached to the wall. On either side of this entrance are two Dikpalakas, Nandini and Kamalini. In the ‘Antharala’ prior to the sacred sanctum sanctorum are the images of Lord Ganesha on the left side and of ‘Bhyrava’ on the right side. To the left of Ganesha, there is a beautiful 6-foot statue of Maharaja Krishnaraja Wodeyar III. He is standing with his hands folded in his religious costumes. On either side of him are his three wives, Ramavilasa, Lakshmivilasa and Krishnavilasa. Their names are carved on the pedestals. In the sanctum sanctorum is the stone statue of the Goddess, ‘Mahisha Mardhini’ having ‘Ashta Bhujas’ or eight shoulders, she is in a seated posture. According to the local legend, the image was established by sage Markandeya and hence it is said to be very old. The idol of the Goddess is decorated every day and worshipped by a number of priests. The Mysore Maharajas have donated number of valuable gifts to their family deity.Coconuts, fruits and flowers are offered to the diety. On top of the sanctum sanctorum, a small tower or ‘Vimana’ is seen. In the ‘Prakara’ or enclosure, behind the sanctum sanctorum, are small images of a few deities, which are also worshipped. 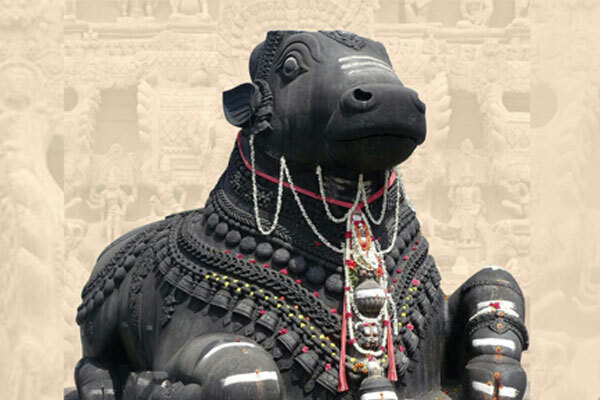 Besides the Chamundeswari temple, one can see Mahabaladri, Narayanaswamy temples and Mahishasura and Nandi statues, there are a few other interesting spots on the Chamundi Hills. Among them the Lalith Palace is one built on the hill-top and it is belongs to the Mysuru royal family. The Maharajas were making a short stay in this Palace whenever they paid visit the hills. it offers an attractive bird’s eye view of Mysuru city and far off places. Lalithadri Palace was built during the reign of Krishnaraja Wodeyar IV.